Silver Shadow perfume engulfs you in its mysterious charms creating an irresistible aura. 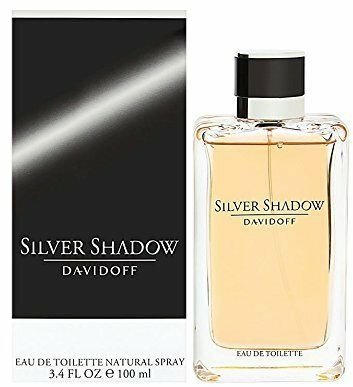 This Davidoff perfume is available in a fancy 100ml flacon.The Silver Shadow perfume by Davidoff for Men is a woody fragrance for bold men. The fragrance will take your olfactory senses beyond moments and memories creating a mysterious aura that is more than a signature. The scent is perfect for charismatic men who have lived more, seen more, and want more in life. The oriental fragrance was introduced by the celebrated Swiss fashion house, Davidoff. It scent comes in a fancy 100ml two-toned flacon that looks enigmatic and enticing. Its main accords include warm spicy, woody, amber, balsamic, and citrus. This Davidoff perfume opens with fresh notes of bitter orange and cedar leaves. While the bitter orange lends it a citrusy touch, the cedar leaves add a woody edge. It is perfect to be worn on romantic evenings to impress your date. The heart of the Silver Shadow perfume is formed of an intense and pungent saffron. The aroma coming from it is rejuvenating and spicy and keeps you refreshed till the notes work their charm. The oriental harmony that comes from amber and patchouli notes form the base of the Davidoff Silver Shadow perfume. The fragrance coming from this composition is sweet, dark, cozy, and warm with an earthy, woody edge.